This article first appeared on 9/18/18. Just checked the Boca Block Box box office (bocablackbox.com) and goldstar.com (discount tickets) and there are a handful of tickets available for Greg Hahn’s 11/21/18 (8pm) Boca Black Box show. No bs- this guy Hahn is off the chart funny. Don’t miss him! If you wanna see one of the most brilliantly- funny comedians currently working America’s comedy club/casino/resort/event circuit- then you gotta go see Greg Hahn! Jeff Eats and Mrs. Jeff Eats recently saw Hahn’s stand-up act at the Boca Black Box- and I am telling you guys, the man is a phenomenally funny comedian! A favorite on the nationally syndicated Bob and Tom Radio Show. He has appeared on Late Night with Conan Obrien, Comedy Central, CBS, ABC, FOX, MTV and CMT. 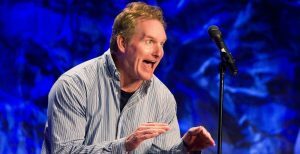 Greg Hahn has parlayed his absurdly energetic, all out style of physical humor, one liners and crowd work into a performance of immediate pandemonium and continuous laughs. His unique stylings have led to numerous television, corporate and theater appearances throughout the US and Canada. Greg was raised in South Florida where in high school he amused the Catholic nuns by poking holes in his pockets enabling pencils to shoot out of his pant leg. As a college basketball player, his enjoyment of half court shots earned him a sweet spot on the bench.As a Captain in the Marines Corps, Greg kept his men highly motivated and could not overemphasize that camouflage is continuous. While a buyer for Lockheed Corporation, he thought why make $200 a day, when I can be a comedian and make that in a week .After several serious jobs where he refused to be serious, Greg turned pro as a stand up comedian and landed a job as emcee for a theme park lumberjack show. This supplied him with four audiences a day, intoxicated ax swinging lumberjacks, and a log rolling dog. Soon afterwards, he worked as stuntman in the Wild Wild Wild West Stunt Show at Universal Studios. For $20 an hour, I would run out and get hit in the head with a stick, perfect! He continually honed his style of comedy then headed to New York City. While in New York, Greg developed into a touring headliner and costarred in the independent film Tomorrow Night which premiered at theSundance Film Festival. Then, after successful shows at the Montreal and Chicago Comedy Festivals, Greg enjoyed television appearances on Late Night with Conan OBrien (NBC), Premium Blend (Comedy Central), Make Me Laugh (5 episodes, Comedy Central), Louis CKs Pulp Comics (Comedy Central), 30 Seconds to Fame (Fox), Cedric the Entertainer Presents (Fox) and Star Search (CBS). When appearing on Star Search, Greg was spotted by Tom Griswold of the nationally syndicated Bob & Tom Radio Show. Greg has since established himself as a favorite guest on the show and starred on the Bob @ Tom Comedy Central Special. He also headlines the Friends of The Bob @ Tom Theater Tour, which included a stop at the Las Vegas Comedy Festival. A return appearance to the Montreal Comedy Festival along with the Halifax Comedy Festival and wild appearances on Country Music Televisions Comedy Stage, Comics Unleashed with Byron Allen and running for president on TOSH.O (Comedy Central) have added to Gregs popularity. Greg now lives in Los Angeles where he continues to infiltrate the TV and movie biz with the intention of buying a llama farm and a kitchen fish tank. Saw him last May at BBB and he was terrific. My wife and i recently caught his act the Boca Black Box and he is very funny. He puts on a fast paced non stop show that has to be seen.